A pileipellis that lacks clearly differentiated pileocystidia when viewed in a KOH mount. There is little chance, however, that the North American mushroom I've described and illustrated here is actually Russula sororia--a European mushroom first described by Fries in 1838. 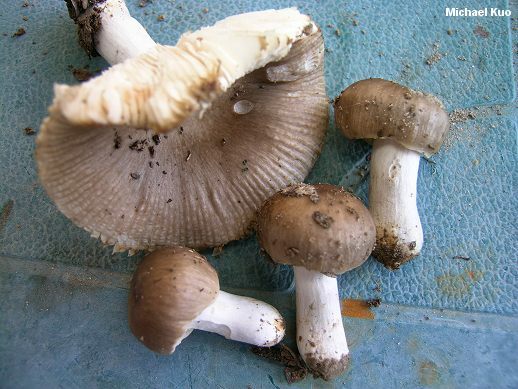 The dark brown, acrid russulas form a group that has been hotly debated for many years, and it is likely that none of the current species concepts is particularly accurate. For a thorough account of the putative differences between Russula sororia and similar brown russulas, see Roberts (2008, p. 113). Russula amoenolens and Russula pectinatoides are very similar mushrooms that feature a maraschino cherry component in their odors; the former is a little stockier than the mushroom featured here, while the latter is smaller, and features a mild taste and a paler, straw-colored cap. Ecology: Mycorrhizal with oaks or with eastern white pine; growing scattered to gregariously, sometimes in urban settings; June through October; Illinois and Missouri. Cap: 2-7 cm; convex when young, becoming broadly convex to flat with a shallow depression; sticky when young and fresh, becoming dry; fairly smooth; medium to dark grayish brown, fading somewhat with age; the margin lined and pimply for 1-1.5 cm by maturity; the skin usually peeling away easily at the margin, sometimes nearly halfway to the center. 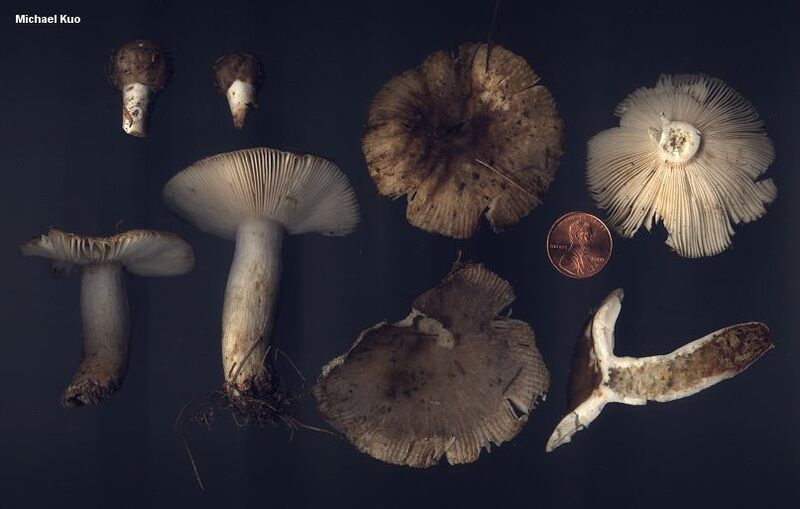 Gills: Attached or nearly free from the stem; close; not forking, or forking occasionally near the stem; with infrequent or absent short-gills; white to creamy, spotting brownish to reddish brown with age. Stem: 3-5 cm long; up to 1.5 cm thick; white, discoloring brownish to reddish brown; dry; often becoming cavernous; fairly smooth. Odor and Taste: Odor oily or waxy, sometimes with a spermatic component; taste (be sure to include the gills in your test) moderately to strongly acrid--but developing slowly, sometimes over the course of 30-60 seconds. Chemical Reactions: KOH on cap surface negative or slowly pale magenta. Iron salts on stem surface negative. 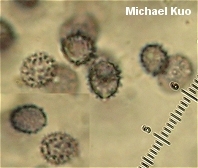 Microscopic Features: Spores 6-8 x 5-7 µ; elliptical to subglobose; warts extending to .75 µ, isolated; connectors scattered and rare, not forming reticulated areas. Pleurocystidia more or less mucronate; scattered to abundant. 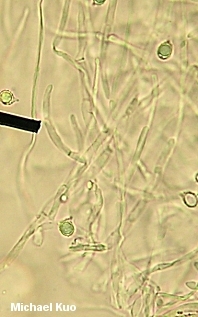 Pileipellis a cutis of interwoven hyaline elements embedded in a gelatinous matrix; hyphal ends subacute to rounded; pileocystidia not clearly differentiated in a KOH mount. REFERENCES: Fries, 1838. (Saccardo, 1887; Kauffman, 1918; Arora, 1986; Hansen & Knudsen, 1992; Roberts, 2008.) Herb. Kuo 06249504, 08290203, 10040503, 07070707, 09190801.